Weather Channel: "It's Been One Of The Most Miserable Starts To Winter On Record"
Across the Northeast, Midwest, and Plains, it has been one of the coldest and snowiest starts to the winter season on record. "Winter has gotten off to a fast start across a majority of the United States, particularly across the Northeast. Early season snow plagued I-95 in mid-November, bringing New York City it’s earliest 6” snowfall on record. Record cold blanketed the region on Thanksgiving, partly causing a rapid spike in natural gas prices. Cold also likely played a role in retail performance over the holiday weekend. While most see a reprieve from cold over the next 7 days, another blast of arctic air is expected later in the first week of December across the eastern U.S., which may further complicate energy market movement going forward," said Ed Vallee, head meteorologist at Vallee Weather Consulting. Central New York, the Baltimore–Washington metropolitan area, and much of the Rust Belt have already reported one of the snowiest starts to November in decades. 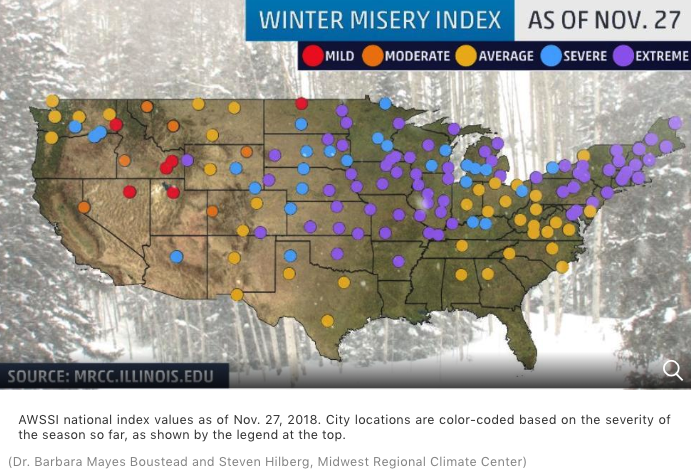 According to the Accumulated Winter Season Severity Index (AWSSI) also known as the "Winter Misery Index" from the Midwest Regional Climate Center, 74 metro areas from New England to the Plains and Rockies have experienced cold and snow that generally would not occur until January. 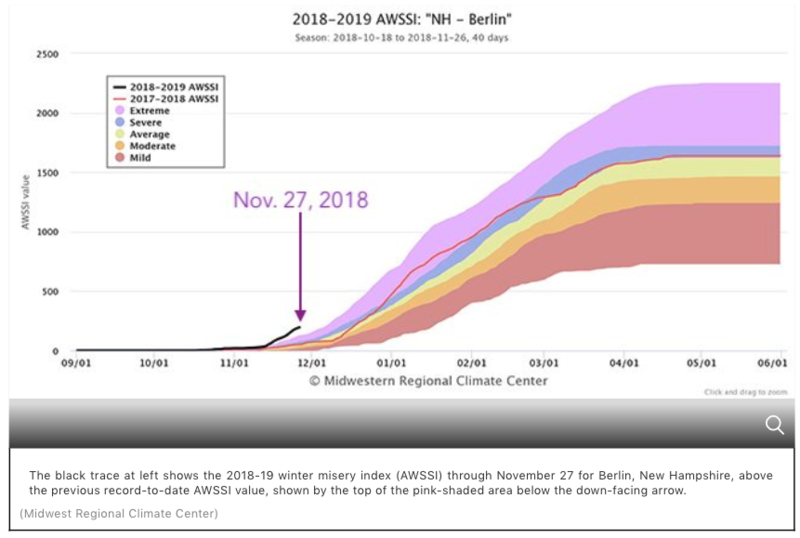 AWSSI index computes the "intensity and persistence of cold weather, the frequency and amount of snow and the amount and persistence of snow on the ground (wind and mixed precipitation are not a part of the index)," the Midwest Regional Climate Center said. The weather index uses five categories – mild, moderate, average, severe and extreme – to assess the severity of winter weather in a particular region. The exact start date of the winter season is defined by the first snowfall (at least 0.1 inches) or when temps dip below 32 degrees or lower, otherwise, the start date is Dec. 01. "The spread among the categories is very narrow this early in the season," said Dr. Barbara Mayes Boustead, a co-creator of the index and an instructor at the National Weather Service's Warning Decision Training Division in Norman, Oklahoma. Metro areas classified as having an extreme winter, so far, ranked in the 99th percentile of the index for Nov. 27, said The Weather Channel, adding that a combination of persistent cold from the Northeast to the Plains and a pair of expansive winter storms, Avery and then Bruce, gave this winter season a fast start. Berlin, New Hampshire: This northern New Hampshire town crushed its previous record-to-date index by picking up 18.6 inches of snow – more than six times its average snow-to-date of only 2.9 inches – and logging six days in which highs did not rise above freezing. Burlington, Vermont: Burlington picked up almost triple its average season-to-date snowfall and had seven days during which temperatures did not rise above freezing. Caribou, Maine: This town in northern Maine already picked up roughly one-quarter of its average seasonal snow even before winter officially arrived. Snow from Winter Storm Bruce was still falling as of publication. Add 11 days which the daytime high didn't rise above freezing, and you can see why the index is at a season-to-date record. Jackman, Maine: Similar to Berlin, Jackman's 14 days of freezing or colder high temperatures and more than double its average season-to-date snowfall – almost 20 inches, as of Nov. 26 – put it on a record early-season pace. New York City: This is primarily due to Winter Storm Avery dumping Central Park's second-heaviest November calendar-day snow on record – 6.4 inches – as well as a pair of days that failed to rise above freezing: Thanksgiving and Black Friday. AWSSI shows extreme weather also occurred in Washington DC, Detroit, Chicago, Milwaukee, St. Louis, Des Moines, Omaha, Kansas City, Little Rock, and Oklahoma City. More than two dozen cities registered on the index as severe winter-to-date, which is one notch below extreme on the AWSSI scale. Among these cities are Buffalo, New York; Louisville, Kentucky; Minneapolis; Pierre, South Dakota; and Flagstaff, Arizona. "We can't judge much about the upcoming winter season based on the early-season AWSSI," Mayes Boustead said. "It isn't until maybe January that we can start to get a feel for the character of the winter. "That said, it's certainly striking to see a lot of cold and snowy early-season winter conditions across a wide swath of the country. With a 75-80% chance of the weather phenomenon El Niño, a “naturally occurring phenomenon involving fluctuations of ocean surface temperatures in the equatorial Pacific,” for the winter 2018/19, more extreme weather conditions could be in store for the months ahead.